Journey to the centre of the earth; The musical is a performance of adventure comedy for all ages. 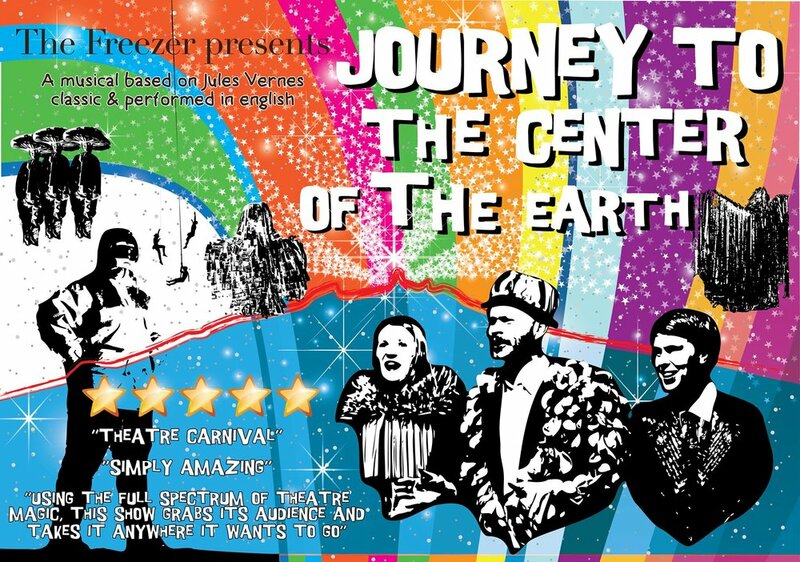 Journey to the centre of the earth is a big scale, comedy fused musical version of Jules Vernes' classic sci-fi novel. This story is the most famous one in the history of West Iceland and now that this great show is alive, everyone will get a change to get to know it. In this show the audience is taken on an exciting trip where top class comedy acting meets dancing, a lot of singing and a big group of local children that provide the show with it's unique feel good factor. Journey to the centre of the earth is two hour long, including two entertaining intervals. The show is performed in english. "Completely amazing in every way"
"This show takes the audience wherever it wants and never lets go. Great execution"
,,This show is a theatre carnival ... Bodyshakingly fun"
"Journey to the centre of the earth is the best ... Better than Hamilton"
Script: Kári Viðarsson and the group. Young actors: Anja Jóhannsdóttir, Birgitta Sveinsdóttir, Björn Óli Snorrason, Dagny Gunnsteinsdóttir, Davíð Hafþórsson, Eir Fannarsdóttir, Jóhanna Guðjónsdóttir, Hanna Guðnadóttir, Helena Hafþórsdóttir, Hjörtur Sigurðsson, Lena Örvardóttir, Lovísa Traustadóttir, Margrét Gísladóttir, Margrét Vilhjálmsdóttir, Selma Emilsdóttir, Stefanía Jóhannsdóttir, Sylvía Scheving. Sound designer: Ragnar Ingi Hrafnkelsson. Cinematographer and editor: Rhys Vee. Musical arrangements: Lilja Dögg Gunnarsdóttir. Show runner and Stage manager: Lucas Rastoll.